Mobile Big Data is the best source of information on the geographical distribution of the population: from long-term dwelling and identifying the place of residence and work-time anchor points, to determining the short term de facto population. The spatial and temporal population changes in response to births, migration, and deaths. Both long-term and short-term migration can be tracked using Mobile Big Data. The number of permanent residents in a specific municipality, work-time anchor points, meaningful locations (secondary homes, summer houses), and de facto population can be deduced from Mobile Big Data. The Positium Data Mediator Population module consists of two sub-modules. Firstly, long-term population that includes residents, work-time anchor points, secondary homes, regularly visited locations, and the statistical aggregations summarising the number of such indicators. Secondly, short-term population (De facto population) that represents the number of people present at a specific time at a specific location, broken-down by the functionality of the people in this location (number of permanent residents, workers, temporary residents, visitors, transit). 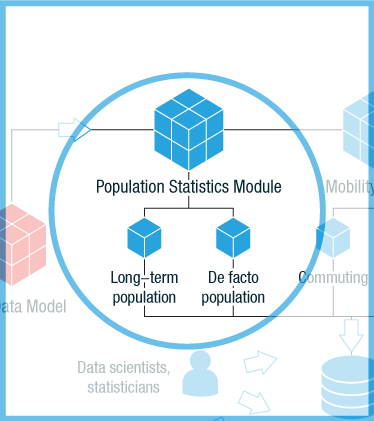 The main users of population statistics from Mobile Big Data are national statistics offices, ministry of regional planning, city governments and municipalities, and resource-planning departments of law enforcement and rescue services.